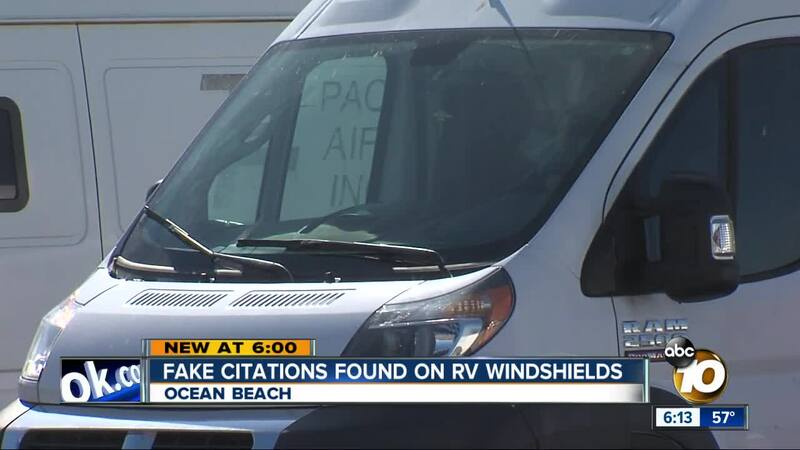 SAN DIEGO (KGTV) — Just days after the San Diego City Council voted to repeal an ordinance that prohibited people from living in their vehicles on city streets, fake parking citations have popped up in Ocean Beach. "I have, and at the current moment I do," Kyle, who didn't want to give his last name or show his face out of fear for his safety, says because of a bizarre incident this week. San Diego Police say their citations have dollar amounts on them, come with an envelop, and say "City of San Diego Police" or "Treasury Office" on them with an official city seal. What’s more, earlier this week the city council voted unanimously to repeal a 1983 ordinance that prohibited people from living in a vehicle on city streets. Which means whoever is doing this has no real authority to do so. Kyle says it’s not sympathy he wants but safety. Especially after hearing another potential reason people put fake flyers on cars. San Diego Police say they have a civilian who does check to see if people are staying in vehicles between the hours of 2 a.m. and 6 a.m. but that in the Western Division alone. That one person gets around 250 reports a night impossible to check on them all.